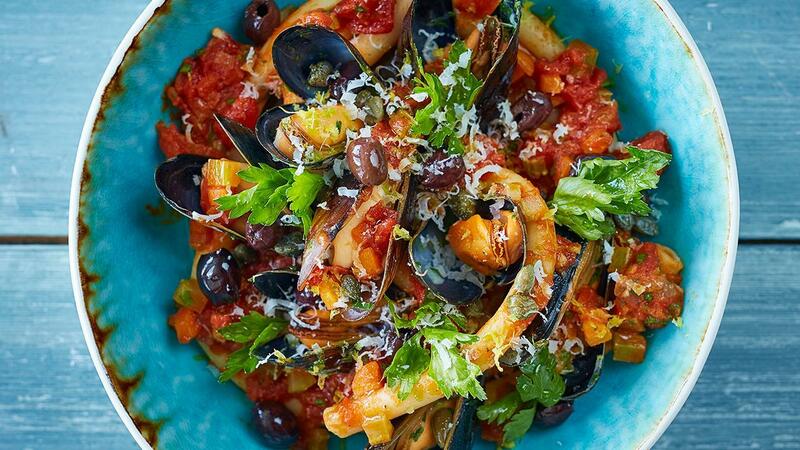 This pasta dish is packed with tomatoes, olives and mussels – simple, fresh Mediterranean flavours on a plate. Perfect. Boil the pasta el dente in water with salt until 3/4th of the cooking time. Roast the garlic in the oven on 150 degrees Celsius until the garlic is puffed and soft. Add the white wine and allow the alcohol boil out. Add 1 table spoon of the chopped garlic. Add the tomato pronto and simmer for 5 minutes.